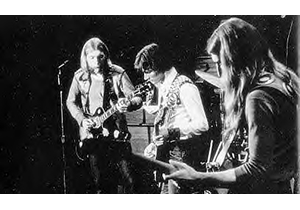 “Melissa” by Allman Brothers Band is a great example of a using the composition technique known in music theory as modal interchange (or modal mixture). Though the music is mostly drawn from the E major scale, notes and chords from two other types of E scales, namely E Mixolydian and E Aeolian (natural minor), are borrowed and thrown into the mix. The end result is a combination of chords that do not all fit together into any one key and can be hard to understand without the right perspective. In this free guitar lesson you play through the chord changes used in “Melissa” and get to know the theory details behind the music. For your reference, you can listen to “Melissa” in the embedded video above. Also, follow along with my guitar instruction by using this free Melissa guitar tab and Melissa Guitar Pro 6 file. The first four bars of Melissa are pretty straight forward even though the chord fingerings are a bit unconventional. The first chord, an open E major, is as basic as it gets. It’s the next two chords that seem a bit odd. You can understand where these chord forms come from by first playing plain old E minor form barre chords at the 2nd and 4th frets. In these positions the barre chord forms become F#m and G#m, which are chords ii and iii out of the E major scale. In order to add more depth and color to these chords, open strings from the initial E major chord are sustained throughout. In other words, as you move from E to F#m to G#m, keep the 6th, 2nd, and 1st strings open the whole time. This means that you only fret the parts of the F#m and G#m chords that land on the other strings, 5, 4, and 3. The end result is that you have chords with added chord tones and extensions, hence the complicated names you see in the score. To keep things simple, don’t dwell much on the chord names, but instead focus on the basic chord shapes from which these chord variations are drawn. In measure 11, the pre-chorus, you play some chords with roots along the 5th string, keeping with the E major scale. By number the changes A-B-C#m are IV-V-vi (4 5 6). Once you hit the D chord, however, you temporarily leave the E major scale. The D natural note is borrowed from the E Mixolydian scale, which is the fifth mode of the A major scale. If you stick with a focus on the music being in the key of E, then the D note is a b7th and the D chord a bVII (b7). Just a few moments later in measure 15 you play a form of C that features a major 7th (the open 2nd string, B), and an alternate bass note (the G at the 3rd fret of the 6th string). This chord is pulled from the E Aeolian scale (better known as the E natural minor scale). The C note and chord relate to E as a b6th and bvi (b6). 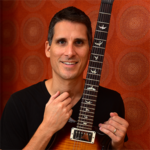 As a lead guitarist, you can think of “Melissa” as being in the key of E and stick with E major scale and E major pentatonic scale patterns for your solos. But when the D chord comes up, you need to either change the D# note in the E major scale to D natural (which changes your patterns from E major to A major), avoid the D# note altogether, or focus on E major pentatonic scale which doesn’t have any type of D in it. When the C chord comes, play the E natural minor scale, E minor pentatonic, or even the C major pentatonic. In the song, I hear the lead guitar remain in E major but switch focus to notes that relate to the C chord. For example, a common bend in E major is the 2nd, F#, to the major 3rd, G# (think a whole-step bend on the 1st string 14th fret). On C you can bend up only a half-step to G natural, thus hitting on a C major chord tone. Perhaps you never thought of this, but in the same way that chords in the E major scale can be used to move to E, chords in the E Mixolydian scale and E Aeolian scale do also. As you move about in the key of E, you can mix and interchange notes and chords from other types of E scales. This concept, along with key changes, borrowed chords, voice leading, circle of fifths, and harmonic minor, is covered at length in my book and DVD program, Fretboard Theory Volume II. But before you jump into advanced levels of music theory like this, be sure to first know the fundamentals as they relate to guitar scales, chords, progressions, and modes, as taught in the first book in the Fretboard Theory series. You can receive a free preview of both Fretboard Theory courses by filling in the form on this webpage. I noticed that the song Love Me Tonight uses the same chord progression and technique you describe above. I was initially playing it with standard barre chords but after reading this post and applying this technique it sounds much closer to the original recording. Thanks.